acceptIT Geschäftsführer Stefan Lage kennt sich bestens mit Domino10 aus UND mit der Roadmap Domino2025. Es ist mehr als sein Job, es ist seine Leidenschaft. Jüngster Beleg für dieses profunde Know-how ist sein neues "IBM Notes & Domino 10 Sales Advisor V1" Zertifikat. Wenn es um wichtige unternehmenerische Entscheidungen rund um die optimale Aufstellung Ihrer IT geht, sollten Sie unbedingt mit Stefan Lage sprechen! "This badge earner has shown a detailed understanding of IBM Domino 10 and the #domino2025 roadmap, and knows how customers can benefit from the advances in Domino 10. 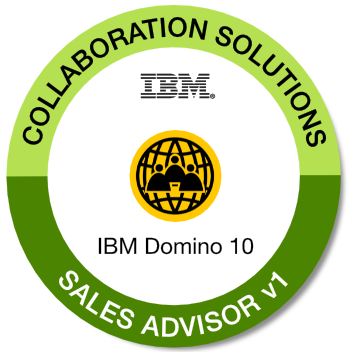 The individual has gained the knowledge to be able to present the roadmap and compelling offerings around IBM Notes & Domino 10 in a sales setting."